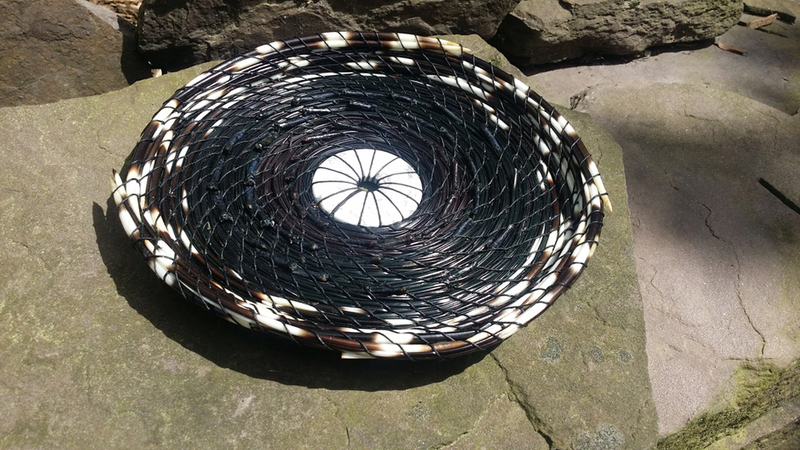 Jane Tolar creates baskets inspired by Gullah sweetgrass and Native American pine needle baskets, both ancient traditions of coiled and stitched natural materials. The materials you see in Jane’s baskets are long leaf pine needles and cordgrasses, the coils bound with linen thread or sinew. She enhances the art of her baskets by integrating beads, shells, and found objects from beaches, bead shops and flea markets into the design. Jane trades Maryland marsh cordgrass for prairie cordgrass with a basket maker in Minnesota; she collects some of her pine needles from the very small grove of long leaf pines in Easton and purchases the rest from Georgia and Florida. Jane is Bethesda born, NC educated and 40 years on Maryland’s Eastern Shore. She practices criminal defense and family law in her own firm, and spends her time in law, basketry, maintenance of her 100-year-old farmhouse and hot air ballooning.